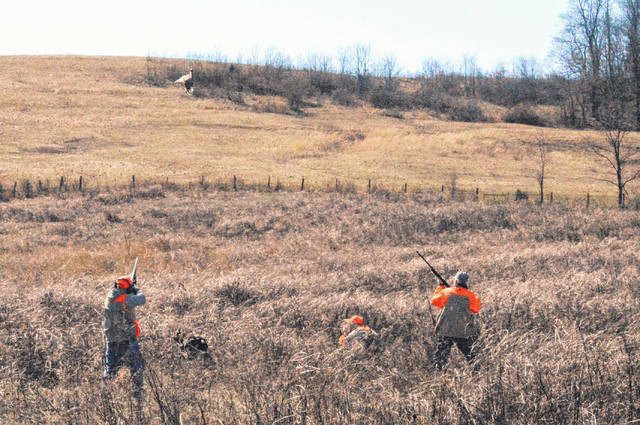 Hunters bring down pheasants during the fifth annual Heroes Tribute Hunt at the McKeans Pheasant Farm. RODNEY — Veterans once again gathered for the fifth annual Heroes Tribute Hunt Saturday at the Elks Farm on Ohio 588 before taking a short trip to the McKeans Pheasant Farm for a day of hunting and fellowship. The event officially ran from 8 a.m. to 4 p.m.
“We run three fields and we have at least four hunts per field,” said Slone. Four pheasants were released per hunter to potentially take home. Among some of the dogs present included German Shorthaired Pointers and German Wirehaired Pointers. The Gallia Soil and Water District along with the Gallia Conservation Club were on hand to discuss exhibits and activities along with the National Archery in the Schools Program and the Passport to Fishing Program. Gallia Shooting Aces 4-H was present to help with trap shooting activities. The Gallipolis Elks Lodge lent the use of its facilities on the farm. Dogs reportedly are trained to point the bird out and a hunter is intended to prompt it to fly before the animal is taken. Hunters were encouraged to shoot only once the birds were in the air for the sake of safety. Reportedly, a variety of shotgun gauges were used in the hunts.